Vegetarianism? A must? Is it compulsory? Is it if you are not a vegetarian, you should feel guilty? Seriously, I really give a damn about vegetarianism (Mixed Vegetable Soup, Vegetarian Sandwich & Cauliflower Fritters). If I can every now and then, I will and if I can't, please leave me alone. Stop preaching about your profound need for vegetarianism which you believe will make you a holy grain Hinduism. Well and good, good for you. Can I live my life according to my what I believe is best for me? Thank you. Regardless, its a fact as well in my house we prefer, when a veggie side dish is a concern (Kailan Oyster Sauce, Carrot Poriyal & Indian Style Mustard Greens), we love wholesome vegetarianism instead of adding meat inside for stir frying or even salad. We basically like the concept of totality for a side dish because on the other side, since it will be paired alongside a non-veg main dish, we respect our style to our own vegetarianism. Salads of course, as you know, what else should I say? Especially all about showcasing vegetables? Healthiness, simplicity and easy cooking raw style right? 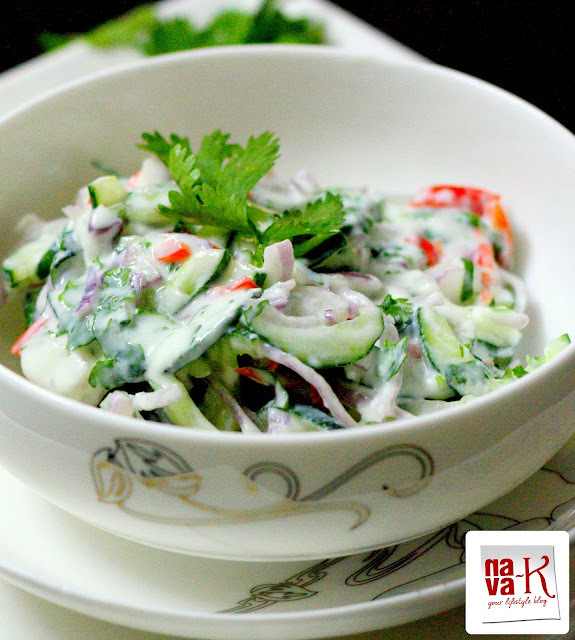 How about this Cucumber Yogurt Salad? Cucumber, onion, yogurt, (Mor Rasam & Bengali Yogurt Fish Curry) coriander leaves and tadbit of spiciness from chillies. Toss all of it and Cucumber Yogurt Salad is on the go (Mango Cucumber Salad & Apple Cucumber Salad). Rawwww!!! Add all the ingredients into a mixing bowl. Give a good stir and that's it. This looks so good and refreshing. Perfect dish for the current heatwave! True, vegetables are must and even yogurt. 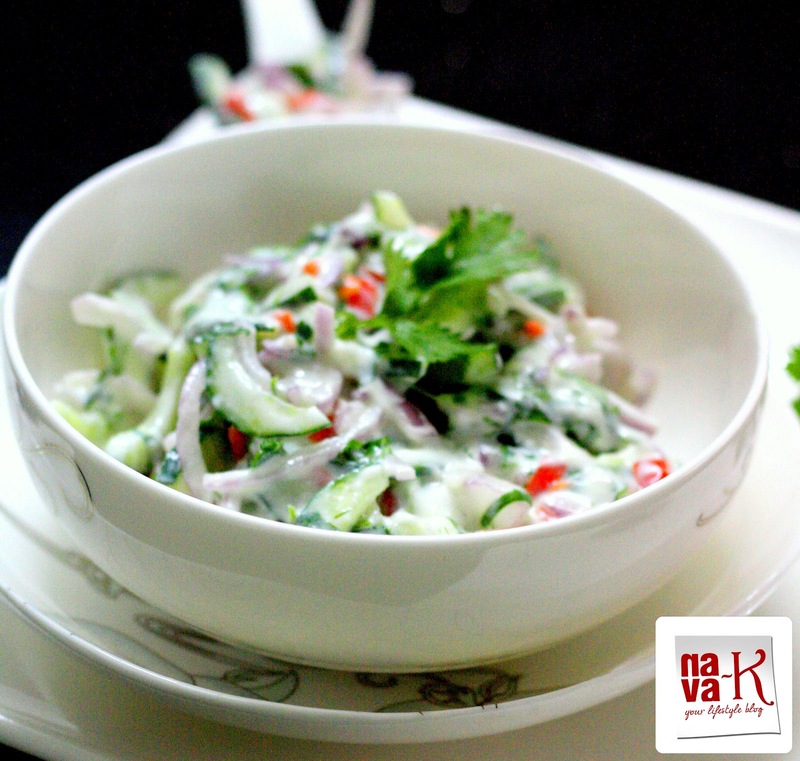 And you have made such a wonderful side dish with cucumber and yogurt. This looks like such a simple and delicious side. It would be great with the burgers I'm making tomorrow! I love this kind of salad! Sounds really healthy and refreshing! hi nava, wow! your veggie really looks cool, pretty and very appetizing. I like its easy in preparation..but super in taste. Just back from shopping trip in Korea. It's nice to be greeted by a lovely recipe. Lots of blog hopping to catch up :) Have a good week ahead! A simple, refreshing and definitely healthy salad. Perfect for the current hot weather. Not tried this at home as simple as it is...am glad you shared the recipe. THANX!!! Love the look of this salad. Its so pretty!! Sounds delicious too! Perfect for the scorching summer. Happy to be your new follower and do drop by mine when you find time.